ImportFood.com has been selling the finest quality pre-made Thai curry paste since 1999. 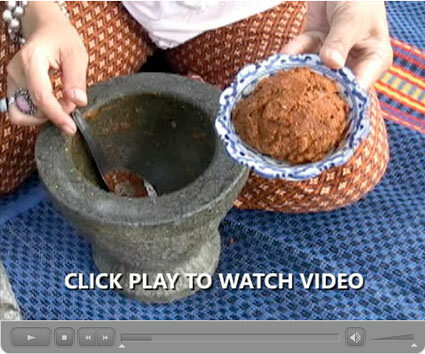 While we recommend packaged curry paste for overall quality and convenience, many people have expressed an interest in making their own curry paste in a mortar and pestle, using fresh ingredients and spices--all of which we have available. With the information on this page you can now make your own Thai curry paste, and we describe the difference between red, green, panang, yellow and massaman curries. 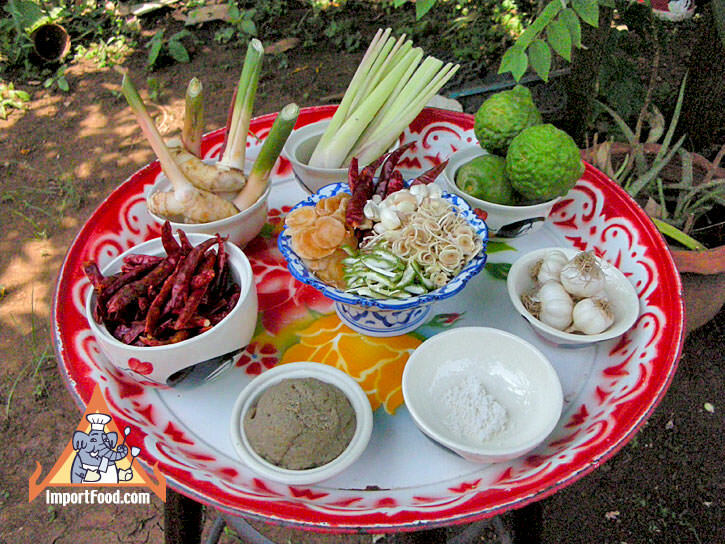 Please enjoy the photos and step-by-step videos of our cousin Chantana, a chef in Kanchanaburi, Thailand, as she demonstrates how it's done. Note the elegant pedestal plates she uses. Start by pounding the garlic in a mortar and pestle, then add the lemongrass, followed by galangal, and pulverize all of this together. Next pound in the kaffir lime leaves. Add salt, pound more, then add whole dried chiles. Mix this into a paste, then add shrimp paste. Pound it all together. 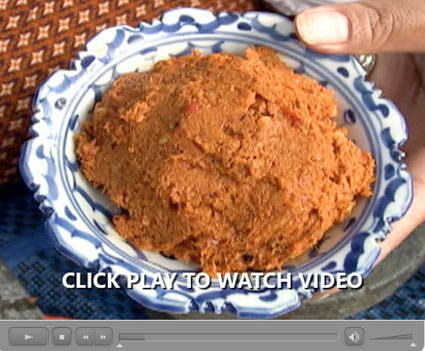 What you have now is a very good basic red curry paste that's ready to use. Using the best quality ingredients will always guarantee an excellent result. Try our recipe for Thai fish cakes made with red curry paste. Whether making red (above), green, panang, matsaman or yellow curry paste, chefs will typically choose to make the above paste first, then add a few more ingredients to enhance the flavor--typically, roasted corriander seed, fresh corriander root, whole white peppercorn, roasted cumin seeds, and fresh shallots can be added. Add some or all of those as you wish to enhance the flavor to your particular style. To roast seeds, simply heat them in a hot dry wok or frying pan over low heat for a few minutes (until they become fragrant) then remove from heat. Instead of whole dried chiles, use fresh green chile peppers. 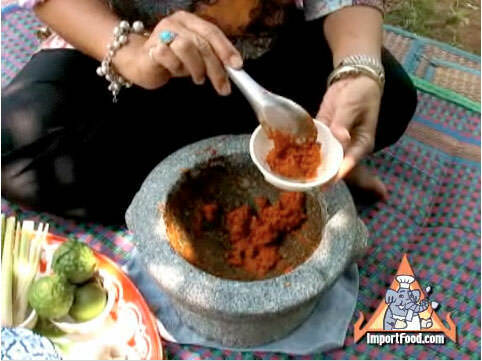 Everything else is made as described in how to make red curry paste, including how to adjust the flavors. Try our recipe for Thai green curry chicken. The flavor of yellow curry is inspired by Indian food. Use fewer whole dried chiles, no whole white peppercorn, no corriander root, and no kaffir lime leaves. Add ginger, and curry powder (which has turmeric, cinnamon and star anise). All non-fresh spices should be roasted in a dry wok first. Shrimp paste is optional. Prepare red curry paste then add a bit of nutmeg, mace, clove, cardamom and cinnamon. Roast those spices over low heat in a dry wok first, then pound into the red curry paste. Try our recipe for massaman chicken curry. Although there is no specific rule, in the old tradition if onions are added to your massaman curry then do not add peanuts. If shallots are used then add peanuts. Panang is a dry curry, meaning that the final dish is not soupy with a lot of coconut milk (see our recipe for panang chicken). To make panang curry paste, prepare red curry paste as above then add ground roasted peanuts to the mortar and pestle at the end. An age-old way to make your curry paste thicker is to add "kao bua", jasmine rice (or sticky rice) that's been soaked in water then pounded with chile paste. Thai curry comes from natural plants that provide strong medicinal properties. Despite tremendous flavor, the purpose of a curry blend is primarily to prevent food spoilage. Kaffir Lime Leaves. Kaffir leaves have antioxidant properties and contain volatile oil. A digestive aid, kaffir leaves cleanse the blood while helping maintain healthy teeth and gums. Kaffir can be applied to the hair and scalp, and even prevents hair loss. It is used as a deodorant. Lemongrass. Contains the volatile oil citral along with citronellal, both sedatives. Lemongrass detoxifies the liver, pancreas, kidney, bladder and the digestive tract. It reduces uric acid along with blood pressure, cholesterol, excess fats and other toxins. Lemongrass stimulates digestion, blood circulation, and lactation. Galangal Root. Contains the volatile oils alpha-pinene, cineole and linalool. It resembles ginger root and is known as the "defisher" as it reduces the fishy smell of foods. Galangal stimulates digestion, alleviates motion sickness and nausea, and reduces inflammation of the stomach and ulcers. Galangal root boosts the immune system, treats colds and flu, reduces fever and rheumatism, and freshens the breath. Galangal has antibacterial and antispasmodic properties. Shrimp Paste. A complete and concentrated food, has healthy polyunsaturated fatty acids and is a powerful antioxidant. 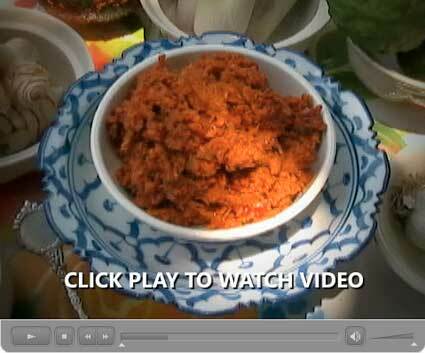 See how shrimp paste is made. Thank you for these instructions! I have missed curry because I am allergic to garlic and all the pre-made pastes have garlic. Can you suggest maybe an alternative, like maybe shallot? Also, I am borderline for shrimp, is there something else I could use in place of that?